WILL INCANDESCENT LIGHT BULBS SOON BE ILLEGAL? Australia, Canada, and the European Union have all passed laws phasing out the sale of incandescent light bulbs. These bulbs will soon be illegal in many other countries as well. The California legislature will vote sometime later this year on a bill to ban incandescent light bulbs here, and Congress is considering a bill to ban incandescent bulbs nationwide. Why? The incandescent light bulb has not changed or improved in any significant way since it was first invented by Thomas Edison over 125 years ago. It is a very inefficient way of converting electricity into light. That is because over 90% of the electricity used by an incandescent bulb is wasted as heat. The heat given off by incandescent light bulbs reminds me of the Suzy Homemaker oven, one of the most popular toys of the 1960s. Kids could bake real cookies and cakes in their Suzy Homemaker ovens. The heat source was one 100 watt light bulb, which was more than adequate to do the job. Suzy Homemaker ovens could reach temperatures of over 700 degrees inside, hot enough to melt lead! All that heat came from just one 100 watt light bulb. This type of toy oven is still being made. 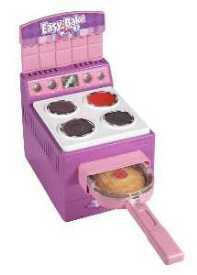 Hasbro's Easy Bake ovens are sold everywhere and have been on the market for over 40 years. Easy Bake ovens also operate on one 100 watt light bulb, and they too get hot. Over 1 million Easy Bake ovens were recalled in 2007 after hundreds of children were injured using these ovens, including many second and third degree burns, and leading in one case to the amputation of a child's finger. This is not a toy I recommend. CFLs (Compact Florescent Bulbs) use electricity far more efficiently than incandescent bulbs. For those of you interested in the physics of this, it is a question of the ratio of lumens (light) to watts (electricity). An ordinary incandescent light bulb has a lumens to watts ratio of 15. A CFL has a ratio of 60, meaning that a CFL gets 4 times as much light as an incandescent bulb from the same amount of electricity. In the not too distant future, CFLs may become obsolete too. Some LED lights already on the market have a lumens to watts ratio of 100. Remember, if you want free CFLs, just come to my chocolate room and pick them up. BEWARE OF PHONY "FREE CREDIT REPORT" WEB SITES. Under Federal law, you are entitled to a free copy of your credit report once every year from each of the three major credit bureaus: Equifax, Experian, and TransUnion. These 3 companies jointly operate a web site: AnnualCreditReport.com where you can get free credit reports from each of these companies at no cost and with no strings attached. Unfortunately, spam e-mails and TV advertising are directing consumers to look-alike web sites. These sites appear to offer free credit reports, but they are usually expensive credit monitoring services instead. For example, you may have seen TV commercials for FreeCreditReport.com. The name of the company and their catchy jingles Free Credit Report Jingle may give you the impression that they are in the business of providing people with free credit reports, but that is not the truth. In order to get a so-called "free credit report" from FreeCreditReport.com, you have to give them your credit card number first, after which, they will charge your credit card $14.95 a month for credit monitoring, whether you want this service or not. Imagine, paying $180 a year for a "free credit report"! And stopping the automatic monthly billing to your credit card with some of these companies can be very difficult. Here are some tips for getting really free credit reports. Only go to: AnnualCreditReport.com for free credit reports. Watch your spelling carefully when you go to this site. There are a lot of phony "free credit report" web sites, and many of them have names that are just one letter away from the real thing. Never respond to e-mails or TV ads for free credit reports. Space out your three free credit reports over the year. This will allow you see changes that occur over time. Print out your credit report as soon as you see it on your monitor. You may not be able to gain free access to it later. Its good to have a printed copy of your credit report on hand anyway. You may find it useful when applying for a job, credit, or an apartment. People often give me credit reports with their rental applications. After you have your credit report, quit your browser if you are at a computer that is shared or accessible by others. Maybe I should run my chocolate room the way these "free credit report" guys do business - before you get any free chocolate, you give me your credit card number first, and then I bill your credit card $14.95 a month to monitor your chocolate preferences. How does that sound? WORST APPLICATION EVER. Here's another candidate for the title of Worst Application Ever. Rent Is Theft. In 2002, I rented a house on Canning Street in Oakland. I remember one applicant particularly well because of the way he was dressed. He was wearing a t-shirt that said "I'd Rather Be Smashing Capitalism" over a raised fist. I had seen that t-shirt before. Street vendors on Telegraph Avenue sell them. He was also wearing a large button, about 4" in diameter, that said "Rent Is Theft!" Now ordinarily, the way an applicant is dressed doesn't affect his chances of getting a rental from me, but in this case it did. I rented the house to someone else. Several weeks later, I told the owners of Homefinders, a rental agency, about this guy. They said that they knew this man very well because he was one of their clients. They said that he always went to apartment showings dressed that way. He had applied for dozens of apartments, but he was always rejected, and he didn't know why. They said: "We repeatedly told him to go home and change his clothes before going out to look at apartments, but he just wouldn't do it." I think you can buy "Rent Is Theft!" buttons on the internet. I saw this guy again just recently. He was at Cafe Roma drinking coffee at one of the outdoor tables. He was wearing a circle-A anarchy t-shirt and reading "The Squatter's Handbook." I was tempted to ask him if he was still looking for an apartment, but I just kept walking. WHY ARE OREOS BLACK? Oreos are made with cocoa powder, so it seems like the cookies should be brown, not black. Many people assume that Oreos contain black food coloring, but they don't. The black color comes from the cocoa itself. There are 2 kinds of cocoa powder, natural and Dutched. Most of the cocoa sold in supermarkets in the U.S. is natural; including Hershey, Nestle, and Scharffenberger. Natural cocoa is light to medium brown in color. My brownie mix is made with natural cocoa. However, most of the cocoa sold in Europe is Dutched, which means that it has been treated with alkali. Dutched cocoa need not come from Holland. Alkali-treated cocoa is called Dutched simply because the process was invented there. Natural cocoa contains acid. Dutching neutralizes the acid and makes cocoa darker. The more that cocoa is Dutched, the darker it gets. Oreos, Hydrox, Newman-Os, and Famous Amos sandwich cookies are all made with highly Dutched cocoa, which is why the cookies are black. Oreos do not contain artificial coloring. Staples has just opened a store in downtown Berkeley. Did you know that Staples pays $3 each for empty ink and toner cartridges? They don't care where you bought the cartridges in the first place, and they don't ask. This is clearly the best deal in the store. First, you have to get a Staples Rewards card, which is free. Then you can bring in up to 3 empty cartridges per store visit for credit towards the purchase of new ink and toner cartridges. I like the idea of getting paid for recycling, and this sure beats any other recycling rebate. The deposit on soft drink and beer bottles and cans is just 5 cents, so you would have to return 60 cans or bottles to get $3.00. SIMPSONS TOYS & GIFTWARE.In the late 1990s, I operated an internet store that sold licensed Simpsons products. At its peak, I carried over 300 different items. My apartment had boxes of merchandise everywhere, stacked up to the ceiling. My kitchen looked like - and was - a warehouse. While the business was modestly profitable, it was very time-consuming, and it had no future, so I shut it down. The problem was that Twentieth Century Fox didn't like internet retailing. They preferred to have their products sold in big-box chain stores, like Walmart and Toys R Us. I thought that was a bad business decision on their part since it seemed obvious that internet retailing was not just a passing fad. I still have some remaining Simpsons inventory. Among the items available: Simpsons bar trays, Simpsons shot glasses, Simpsons playing cards, also Family Guy playing cards, Simpsons trivia games, Simpsons basketballs, coffee mugs, stickers, posters, and a number of other items. 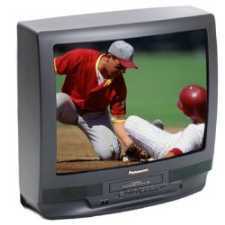 25" PANASONIC TELEVISION with built-in VCR, remote control, & coaxial cable input jack. In perfect condition. I have one. Last month's freebie: The crock pots are all gone. I was surprised at how fast they went. I had 8 of them. One tenant took 2. One group took 3.